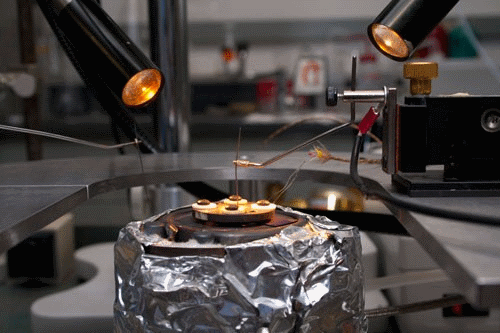 Shriram Ramanathan's laboratory setup for testing solid-oxide fuel cells. Cambridge, Mass. – June 29, 2012 – Imagine a kerosene lamp that continued to shine after the fuel was spent, or an electric stove that could remain hot during a power outage. Materials scientists at Harvard have demonstrated an equivalent feat in clean energy generation with a solid-oxide fuel cell (SOFC) that converts hydrogen into electricity but can also store electrochemical energy like a battery. This fuel cell can continue to produce power for a short time after its fuel has run out. "This thin-film SOFC takes advantage of recent advances in low-temperature operation to incorporate a new and more versatile material," explains principal investigator Shriram Ramanathan, Associate Professor of Materials Science at the Harvard School of Engineering and Applied Sciences (SEAS). "Vanadium oxide (VOx) at the anode behaves as a multifunctional material, allowing the fuel cell to both generate and store energy." Each dark speck within the nine white circles at left is a tiny fuel cell. An AA battery is shown for size comparison. 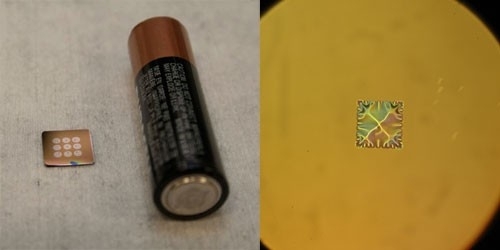 The finding, which appears online in the journal Nano Letters, will be most important for small-scale, portable energy applications, where a very compact and lightweight power supply is essential and the fuel supply may be interrupted. "Unmanned aerial vehicles, for instance, would really benefit from this," says lead author Quentin Van Overmeere, a postdoctoral fellow at SEAS. "When it's impossible to refuel in the field, an extra boost of stored energy could extend the device's lifespan significantly." Ramanathan, Van Overmeere, and their coauthor Kian Kerman (a graduate student at SEAS) typically work on thin-film SOFCs that use platinum for the electrodes (the two "poles" known as the anode and the cathode). But when a platinum-anode SOFC runs out of fuel, it can continue to generate power for only about 15 seconds before the electrochemical reaction peters out. Left: Each dark speck within the nine white circles at left is a tiny fuel cell. An AA battery is shown for size comparison. Right: One of the nine circles is magnified in this image, showing the wrinkled surface of the electrochemical membrane. The new SOFC uses a bilayer of platinum and VOx for the anode, which allows the cell to continue operating without fuel for up to 14 times as long (3 minutes, 30 seconds, at a current density of 0.2 mA/cm2). 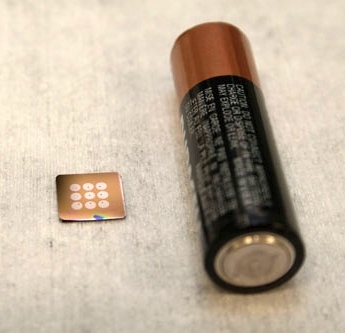 This early result is only a "proof of concept," according to Ramanathan, and his team predicts that future improvements to the composition of the VOx-platinum anode will further extend the cell's lifespan. During normal operation, the amount of power produced by the new device is comparable to that produced by a platinum-anode SOFC. Meanwhile, the special nanostructured VOx layer sets up various chemical reactions that continue after the hydrogen fuel has run out. "There are three reactions that potentially take place within the cell due to this vanadium oxide anode," says Ramanathan. "The first is the oxidation of vanadium ions, which we verified through XPS (X-ray photoelectron spectroscopy). The second is the storage of hydrogen within the VOx crystal lattice, which is gradually released and oxidized at the anode. 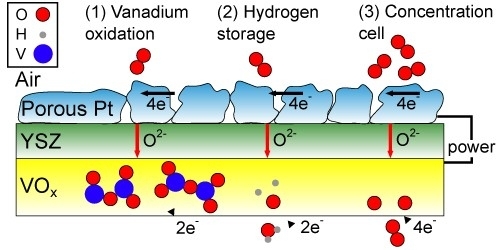 And the third phenomenon we might see is that the concentration of oxygen ions differs from the anode to the cathode, so we may also have oxygen anions being oxidized, as in a concentration cell." All three of those reactions are capable of feeding electrons into a circuit, but it is currently unclear exactly what allows the new fuel cell to keep running. Ramanathan's team has so far determined experimentally and quantitatively that at least two of three possible mechanisms are simultaneously at work. Three possible mechanisms (left to right) can explain the operation of the vanadium oxide / platinum fuel cell after its fuel has been spent. The illustration represents a simplified cross-section of the SOFC: the top layer is the cathode (made of porous platinum), the middle layer is the electrolyte (yttria-stabilized zirconia, YSZ), and the bottom layer is the VOx anode. During normal operation, the hydrogen fuel would be at the bottom of this diagram. Ramanathan and his colleagues estimate that a more advanced fuel cell of this type, capable of producing power without fuel for a longer period of time, will be available for applications testing (e.g., in micro-air vehicles) within 2 years. 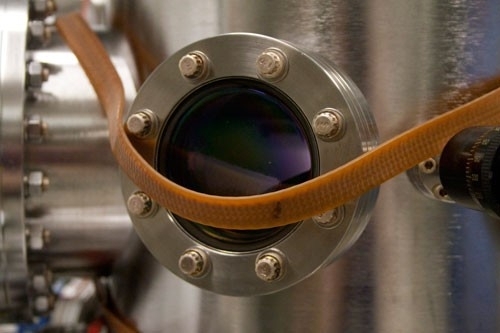 Purple plasma is visible through the window of this vacuum deposition chamber. The equipment is used for creating the extremely thin-layered electrodes and electrolyte on a wafer of silicon. This work was supported by the U.S. National Science Foundation (NSF), a postdoctoral scholarship from Le Fonds de la Recherche Scientifique-FNRS, and the U.S. Department of Defense's National Defense Science and Engineering Graduate Fellowship Program. The researchers also benefited from the resources of the Harvard University Center for Nanoscale Systems (a member of the NSF-funded National Nanotechnology Infrastructure Network) and the NSF-funded MRSEC Shared Experimental Facilities at MIT.